The photo above shows music history being made. 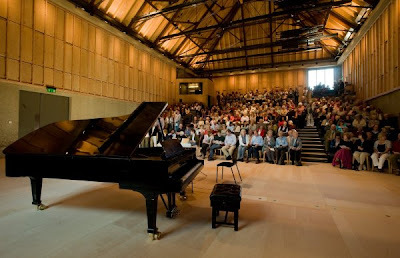 It was taken yesterday at the acoustic test for the new Britten Studio at Snape, and shows the new hall filled with the invited audience who were about to hear the first ever live music in the new auditorium. Leading young musicians performed a range of chamber and vocal works, including pieces by Haydn, Debussy, Vaughan Williams and Rebecca Clarke. 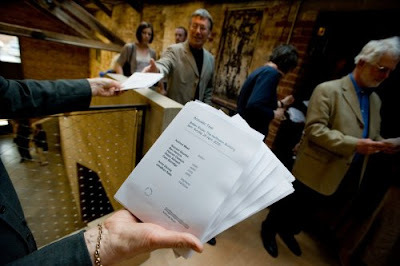 The music was specially selected to allow acoustic experts to assess the sound of the hall with an audience in situ. The Britten Studio is at the centre of the Snape creative campus development that I previewed here in 2006. It is a stone's throw from the legendary Snape Maltings Concert Hall, which for four decades has been the gold-standard for concert hall acoustics. When Snape Maltings was created from disused industrial buildings in 1967 the new concert hall was acclaimed for its 'radical traditionalism' as well as its superlative sound. Over the years the surface textures of Britten's iconic hall have mellowed, leaving the music to perpetuate his radical tradition. But the mellow concert hall now has a radical sibling. Following in Britten's footsteps another derelict maltings has been reclaimed to provide the shell for a new creative centre. Frank Gehry style signature flourishes are conspicuous by their absence. Instead local materials, green thinking and respect for the rural context and vernacular have guided the sensitive conversion by architects Haworth Tompkins. Reclaimed wood from the original maltings forms part of the ceiling, and elsewhere 'found' materials give a wholly appropriate improvisatory feel to the new building. Design flourishes may be absent, but tangible evidence of the over-riding importance of acoustics is very much present in the new Britten Studio. Arup Acoustics, who were responsible for the peerless sound of the main concert hall, were retained for the new development. Lead acoustician Raf Orlowski is a protegé of the legendary Derek Sugden who worked with Britten on the 1967 hall, and Sugden himself was in the Britten Studio yesterday for the acoustic test. Above is a comparison by me of the two halls at Snape, and the photographs show the remarkable 'family' resemblance of the radical sibling to its older parent. 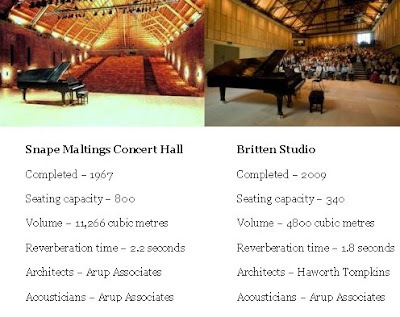 The masterstroke is that the new Britten Studio is smaller and more intimate than the main concert hall, yet the reverberation time - the key metric in determining the sonic signature of a hall - is only slightly shorter. This has been achieved by maximising vertical volume, and by the inspired use of reflective surfaces. Flexibility is a central feature of the the new hall. The concert style seating can be retracted to create a completely open floor space, the acoustics can be fine tuned using movable drapes, and data quality wiring links the new performing spaces for multi-media projects. Yesterday's acoustic test confirmed that the Britten Studio has the legendary Snape sound. The first impression on entering the hall is the astonishingly low ambient noise level. A contributory factor is the absence of conventional air-conditioning, instead an environmentally-friendly heat exchange system uses groundwater from a nearby borehole. But when the music starts, what is most astonishing is the warmth and clarity of the sound, which achieves a near-perfect balance between the dryness of modern halls and the sonic soup of more resonant buildings. The Britten Studio and the adjacent Kiln Studio are extraodinary creative spaces that combine the working traditions of an old industrial building with state of the art technology and superlative acoustics. It was the dearest wish of Benjamin Britten and Peter Pears that one day an inspirational arts centre should be created at Snape. Yesterday that wish became a reality.